Summer All Year Round: What Exactly Are We Eating? Well, It Looks Like Corn Pretty Much. What Exactly Are We Eating? Well, It Looks Like Corn Pretty Much. I have been talking about writing this post for a long time. I feel the time has finally come to write it. 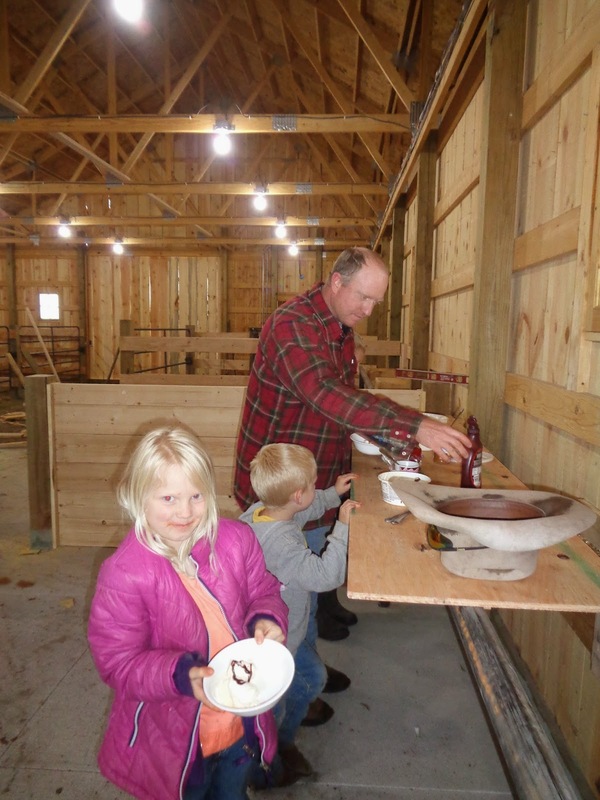 Lately Friday evenings on the Orton Ranch have been spent as a family working on the inside of the barn and having a barbecue of hot dogs and brats. The kids pretty much play around and do some odd jobs while the Ranch Hand and I try and accomplish something to move the barn further towards completion. Last year I learned of an allergy I developed to corn. The kids are always asking me if I can eat this or that because SO many of our every day foods have some sort of corn in them. So here is a quiz: Which of these items from our barbecue have corn and do not have corn in them? The foods in the first picture ALL have corn in them. Corn, corn starch, corn syrup, high fructose corn syrup, and maltodextrin- which is a sweetener derived from corn starch. The bottom picture foods do not have corn in them. Luckily my allergy is not as serious as other food allergies some people have. Mine occur when I get too much of a build up in my system. Changing the foods I buy, like ketchup, bbq sauce, maple syrup, and making more things from scratch has really brought my levels down so every now and then I can eat a meal like this with mild reactions. As I stood there over my Traeger cooking, I was getting a little upset. WHY are food manufacturers putting corn in almost everything you buy at the grocery store? Literally. I dare you to go to the store and investigate for yourself. Fresh produce and some dairy products are corn free, but some dairy products are not. Yogurts have corn starch and most sour cream has an entire list of ingredients including food starch which by the way is corn. It is more expensive but I switched to Daisy sour cream because it is pure cream, and you can taste the difference. Plain old salted potato chips are fried in corn oil. Some canned beans have corn starch and maltodextrin. Most cereals are made out of corn. Crackers, cookies, chips, condiments, processed meats, sport drinks, soda pop, frozen prepared foods, ice cream, bread, CANDY, don't even mention candy!!!! And that's the teeny tiny list! 22.2 teaspoons to be exact. Half of which came from the soda pop. Wow. Glad I skipped the pop. And I wonder why everyone one is in this VERY room as I sit at my computer, bouncing off the walls, including the Ranch Hand, while he plays doctor and dentist with the boys' toy tool set. Maybe I should've had the pop, but I'm enjoying their loudness from a distance. I am the Mom. I am the primary food purchaser. I am responsible for what food comes into my home, and what food goes into these bodies. And I just put 22.2 teaspoons of sugar in there. Now tonight wasn't the norm, and every now and then I think it's ok. I am not a sugar Nazi. In fact better to have the real stuff than the fake stuff. I bake plenty of cookies and cakes, give my kids fruit snacks, and sports drinks. I'm starting to realize what a sugar addicted society we live in. I go through times I am addicted to sugar. Just try and keep track of what you eat, how much sugar you consume, then try and cut it back. You will experience a trial of your will power- because you are addicted too. Back in the early 1900's when processed and canned foods hit the shelves it was simply amazing to have food so readily available and easy to make. When foods get processed however, a lot of the nutrients get lost, ripped away from the whole food. They also don't look very desirable for eating- thus you get the added food dyes, then the added sugars and salt to bring more flavor to the terrible, awful, bland processed piece of, "who knows what that was before they added artificial (pretend) colors?" How about wonderful cute shaped foods? Foods that look like pretend fishies or kindergarten shape identification practice sheets. WTH. Where is the real food? I'd like to know how they make lunch meat, all pressed together and then sliced thin... maybe I don't want to know. Looks like roast sandwiches on homemade bread for a while. All of this information has got me thinking. Why are there so many food allergies today? Why is cancer so wide spread and everyone knows someone that has had or is going through cancer? Is it the artificial fertilizers, the pesticides, insecticides, GMOs, processed foods with added artificial colors and sweeteners? By the way, all of those things I mentioned are fake things, not naturally occurring substances or processes. We as consumers are eating them up, not thinking twice before opening our mouths and putting them in young developing bodies. Food for thought. I don't know, it sure sounds like a witch's brew for a potion to me. But that's just me. Ahhh, deep breath, now that that's off my chest, this is what we got done in the barn tonight: A sink half way hooked up and a board ripped in half to frame in the counter tops. With all that said, we did have a fun evening together in the almost finished barn!